Signing provides children—with and without special needs—a way to express themselves while they continue to develop verbal communication skills. This book introduces 60y American Sign Language signs appropriate for use with babies. Signing techniques, songs, and games are included. This book provides practical, effective tools to teach your baby relevant signs such as “more,” “all done,” “milk,” and others, all while having fun. This illustrated guide explains ways to teach babies simple sign language. Pictures illustrate the suggested signs. Using trusted American Sign Language (ASL), this book is the go-to guide for parents, caregivers, and educators looking to create effective two-way communication. This guide helps parents teach basic signs to their babies. It includes an explanation of how baby signing developed and how it can be used effectively. This book demonstrates playful sign language activities parents can use to interest their babies in learning to sign. It recommends ways to include signing in everyday activities. This book helps teachers use and teach sign language to hearing children up to age 6. 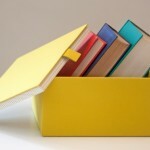 The book is organized by the age of the child. One chapter focuses on the use of sign language with children who have special needs. This book features photographs of the 200 most useful signs and features stage-by-stage guidance, so you’ll know which signs to teach first and which to add your baby progresses. Presents easy-to-follow ASL vocabulary in the following areas of daily function: actions and verbs; clothes; states and cities; food and drinks; and transportation. Includes exercises for using the newly learned vocabulary in sentences. This video includes over 150 words and phrases containing the sounds T, D, & N; higher level concepts including compound words, 2-4 word phrases, and question words; tutorial that teaches parents speech techniques to practice at home; therapists demonstrating T, D, & N sounds and words; and common sign language which enhances communication skills. This video covers: essentials, potty training, animals, body, clothes, colors, descriptors, feelings, food, people, letters, numbers, actions, vehicles and more! Baby Hands Productions; 2004. For ages 10 months & up. 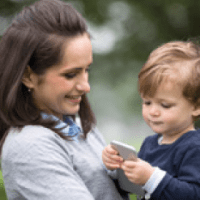 Gives parents and babies the ability to bridge the gap between the time a baby can communicate with his/her hands and the time a baby can speak. This video includes some of the first words that are most loved by babies, focusing on objects and events that babies are naturally attracted to, such as “book,” “car,” “cat,” “drink,” “eat,”, “go,” “milk,” and more. This video uses a combination of American Sign Language signs, spoken word, written text, still images, animation, live video, and sound effects to hold a baby’s attention while teaching signs. This DVD shows parents and educators how to teach signing by the use of songs to babies or children, including those with special needs. This is the first of 13 volumes in a series. Songs, animation, and visuals are used to teach signs for phrases such as “My name is …” Other volumes in this series are related to days of the week, sports, helping, and more. This article discusses the pros and cons of teaching sign language in addition to teaching oral language. Experts in otolaryngology and language development are the contributors. Julie Mitchiner & Michelle Gough, (2017). Helping young deaf and hard of hearing children explore ASL and English is one of the important jobs with which the preschool teachers who work with those children are tasked. Learning ASL and English, the children will become bilingual, fluent in the two languages they will use throughout their lives. This online article defines baby signing, outlines the research on the language development of babies who are taught signing, and provides suggestions for the effective use of signing. Receptive language refers to how well children understand language. Children spend their first year listening to the sounds around them. Sign language can be used to communicate, and helps ease frustrations in young children when they lack the ability to use words. Also in Spanish. This free, 7-module resource was developed to foster an understanding of the importance of early language acquisition that supports robust linguistic competence and conceptual development in children who are deaf or hard of hearing. Also available in Spanish. 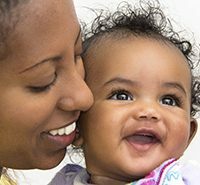 This online article from the American Academy of Pediatrics includes reasons to teach a baby to sign and tips for getting started.